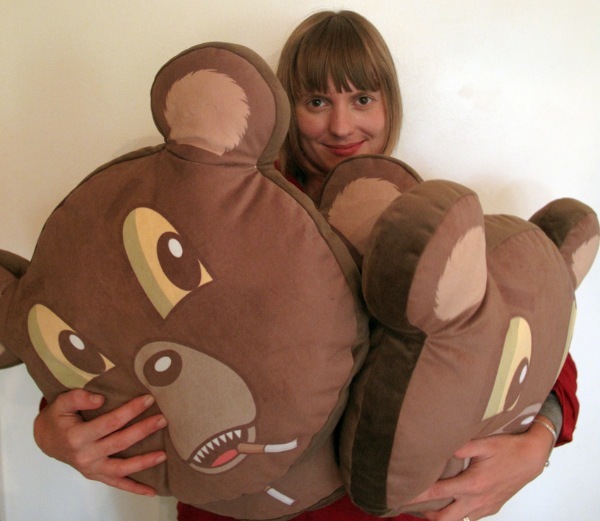 DABS MYLA are set to drop their limited edition ‘Smokey The Bear‘ pillow tomorrow. Each cushion will also come with an original hand painted bear on archival paper that will be signed and numbered as a certificate of authenticity for each cushion. Order them up here: http://dabsmyla.bigcartel.com/ – starting at 12:00pm PST tomorrow – Wednesday, Feb. 22nd. Each cushion and original hand painted certificate of authenticity will sell for $80 USD plus shipping. I know I can’t wait to place this bad boy on our sofa! DABS MYLA recently gifted their second mural to the city of Culver City, this time with their friend MURO from the Canary Islands. The new mural is located just west of their other mural in Culver City (just up the road from Royal-T). This piece is also located within the Branded Arts compound alongside other murals from the likes of Herakut, Crycle, Andrew Hem, David Flores and Anthony Lister. Look for DABS MYLA in our upcoming ‘Picks of the Harvest 2012‘ show next month and keep up with ’em via their blog here. 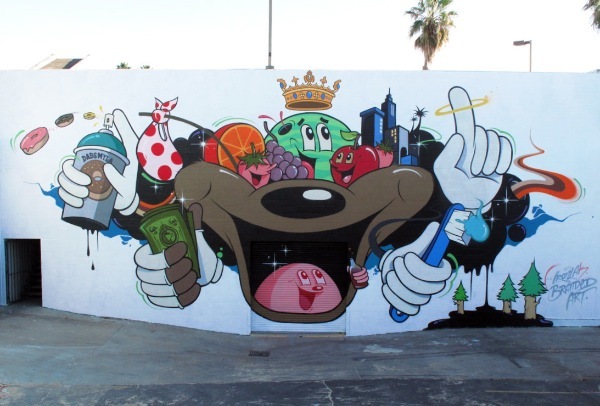 Just before the big Christmas weekend this past year Dabs Myla took over Culver City with a massive new mural set up via Branded Arts and Thinkspace at the intersection of Washington and National. The mural itself isn’t just something cool to look at, there is a very moving and real story that is told with this new mural. Filmmaker Carlos Gonzalez documented the project and his resulting footage is just so uplifting. The final edit is a thing of beauty. DABS MYLA‘s new mural within the Branded Arts Compound over in Culver City is now complete after four days of working from morning to night. Many thanks to Warren Brand and Branded Arts for making this happen and to Carlos Gonzalez for all his time and efforts in helping to document the magic. DABS MYLA are currently at work creating a massive mural in the heart of Culver City as part of the Branded Arts Compound. The Branded Arts Compound is really bringing a breath of fresh air to the Culver City Arts District and currently features large murals from the likes of Herakut, Cyrcle, David Flores, Andrew Hem and Chase. 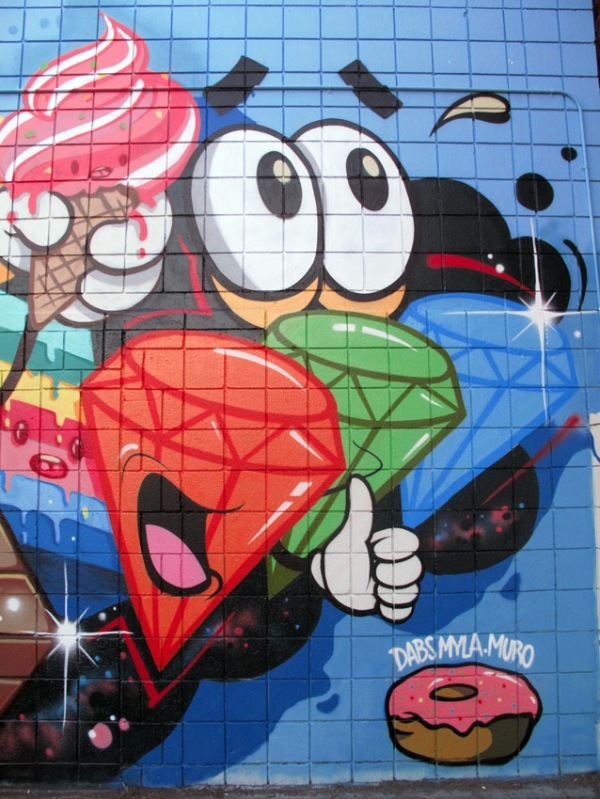 DABS MYLA will be the newest addition and the largest mural yet on the space. 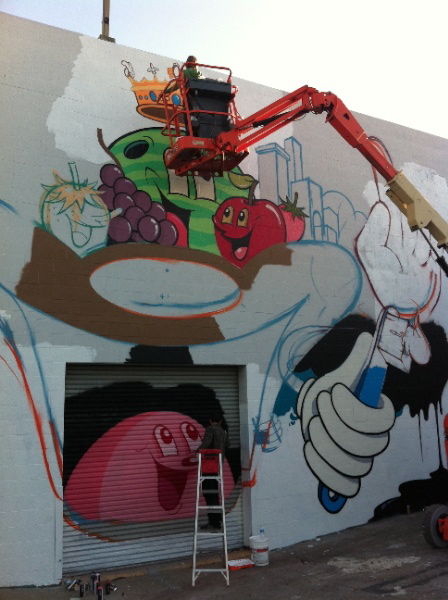 Look for add’l new murals to come to life in 2012 helping to brighten up the Arts District. Many thanks to Branded Arts for helping to make this happen. Look for the next mural from DABS MYLA to come to life at the upcoming Affordable Art Fair where the duo will be creating a 58 foot long by 12 foot high mural to help welcome patrons to the inaugural edition of AAF Los Angeles. Thinkspace will be at Booth B9 and we’ll be featuring a couple of new works from the duo, so please be sure to swing by when you visit the fair this coming January. More details are here.